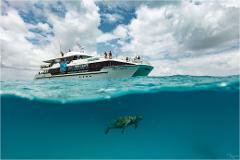 Experience the Southern Great Barrier Reef on-board the luxury catamaran Reef Empress. 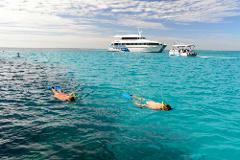 Cruise from Bundaberg Port Marina to Lady Musgrave Island, enjoy morning tea as we make our way to the pristine Lady Musgrave Reef lagoon for snorkeling, glass bottom boat tours, fish feeding and guided island walk. A gourmet buffet lunch using freshest local produce Bundaberg has to offer, will be served on-board during the 4.5 hour stay in the lagoon. Afternoon Tea served on the trip back to Bundaberg. Or for those looking for even more of an experience, upgrade to our Premium ticketing, which includes admission to the upper deck lounge with reserved seating with wait staff available, complimentary tea & coffee throughout the day, complimentary wetsuit hire, a beer/wine or soft drink with a gourmet cheese platter for your return trip. Returning to the Bundaberg Port Marina at 5pm. Warm showers located on the duck board to use after your snorkel or dive. 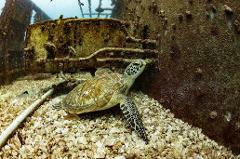 Introductory scuba diving is available on request with a fully qualified scuba diving instructor. Scuba diving for certified divers is also available on request. Select diving options when booking or phone/email to register your interest. All fares include Premium quality Mares snorkeling equipment (mask, snorkel & fins), glass bottom boat tour and guided Island walks. Wet suits are available on board for hire for an additional $10. * Please note a $10.00 EMC/QPWS Fee is automatically added for each adult & child aged 4 years & over entering the Great Barrier Reef World Heritage area. * Some public holidays attract public holiday surcharge. 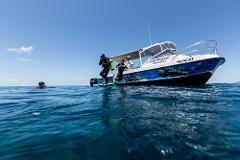 An adventure option for experienced certified divers. Double outer reef dives on-board our dive vessel "Sea Cat". Capable of taking 7 divers to surrounding islands & outer reefs. A Dive Master guides every dive and this is your chance to experience some of the more remote and least accessible dive sites of the Southern Great Barrier Reef. Checking in at 7 am at the Bundaberg Port Marina, Burnett Heads, cruise in style on our luxury catamaran "Main Event" and enjoy morning tea as we make our way to the pristine Lady Musgrave Reef lagoon. Once you arrive into the lagoon transfer to our dive vessel "Sea Cat" for departure to surrounding islands & outer reefs. Lunch included when you return to Main Event before departing back to Bundaberg. A light afternoon tea served and arriving back to the marina at 5pm. * Tanks & weights included. If full equipment required select on extra's page. * This is for CERTIFIED divers only and your certification will need to be presented prior to dive. * An $6.50 EMC Fee is automatically added for each adult & child aged 4 years & over entering the Great Barrier Reef World Heritage area. Depart Burnett Heads, Bundaberg with an hours travel where lies the wreck of the ex HMAS Tobruk in 30 metres of water. Travel in comfort aboard MAIN EVENT, a 27 metre, luxury high speed catamaran. Divers travel in air conditioned comfort and prepare for their unique experience in the upper deck lounge discussing the dive plans and the days events. With in water access across the entire width of the vessel, your decent is at mid ships and directly over the wreck and onto the port side of the ship, at a depth of 12 metres. Groups of 8 are lead by our experienced dive guides to different areas of the wreck. After your first exploration and orientation dive around the wreck, you will then return to the vessel for warm drinks and a buffet lunch as your tank gets refilled for your second dive. When your comfortable 60 minute surface interval is complete, return to the water where you have the chance to explore the wreck inside and swim the length of the tank deck, wheelhouse and other accessible areas. Enjoy your encounters with all the marine life that now call her home before you ascend to MAIN EVENT and prepare for your return transfer. Hot showers, wash tubs, spacious areas with tables and 240v power supplies and flat screen TVs are available to make your Tobruk Dive experience as exciting and comfortable as possible. We look forward to showing you one of Australia’s newest dive sites! Inclusions - 2 tanks, weights, morning tea and lunch. Maximum of 24 divers per day. Please call us direct to discuss discounted rates if you have a group of 10 or more divers. Quality and new Mares Equipment for hire (which can be added on during your booking process). Gloves are mandatory, hire/purchase available if you don't own gloves. Departure times vary based on tides & times will be confirmed with you during the booking process. Your first day starts at the Bundaberg Port Marina for a 7 am check-in. Your vessel for the day, "Reef Empress” is a luxury, high speed, 35 metre catamaran that is custom designed for snorkelling and diving on the reef, providing a platform for the ultimate reef adventure. Spend a night on the Great Barrier Reef and experience the magnificent wonder of the natural phenomenon of the turtles nesting and hatching on Lady Musgrave Island (nesting November through to March and hatching December through to April). Enjoy morning tea as we make our way to the pristine Lady Musgrave Reef lagoon for snorkelling, glass bottom boat tour, fish feeding and guided island walk. A gourmet buffet lunch using freshest local produce Bundaberg has to offer will be served on-board and after lunch be transferred to your floating hotel for the night, "Advance II". Advance II is a 56 foot custom designed yacht capable of sleeping up to two families of 4 or 8 guests. The aft cabin sleeps up to 4 with a double and 2 single beds, with an ensuite. The forward cabin has a double and 2 single beds or 4 single beds with adjoining bathroom and shower. Please note that unless exclusive cabins are booked, you may be sharing a cabin with other guests. Experience an afternoon snorkel at other locations within the lagoon or outer reef, then enjoy a sunset drink and watch the marine life around you before an alfresco style dinner overlooking the Southern Great Barrier Reef and Lady Musgrave Island. After the sun goes down and as the turtles make their way to nest, we then prepare to make our way to the island to learn about the nesting turtles and hatch-lings with our marine biologists & island rangers. Options for night snorkelling and night diving within the lagoon from the vessel allows guests to experience the different marine life and colours that appear after dark. Watch the stars and clear skies of the Southern Great Barrier Reef before a calm nights rest. reef. Lunch will be served on Advance II and then returning you to Reef Empress after lunch for the transfer back to Bundaberg, arriving back at 5 pm. * Please note a $16.00 EMC/QPWS Fee is automatically added for each adult & child aged 4 years & over entering the Great Barrier Reef World Heritage area. 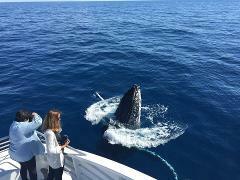 Half day whale watch tours departs Bundaberg Port Marina, 15-17 Marina Drive, Burnett Heads. Check in at 9.45 am for a 10.00 am departure returning at 2.00 pm. Enjoy 4 hours onboard the luxury catamaran Main Event and enjoy spectacular views of Humpback whales at play. Morning Tea & Light lunch included . A fully stocked licensed bar.